Easter Holidays Late deal. Hardingsdown Bunkhouse or The Chaffhouse. Ideal for family and friends to get together. Beautiful beaches, lovely walks and cosy pubs nearby. Free WiFi. Great facilities. Pets very welcome. Hardingsdown Bunkhouse and The Chaffhouse are a perfect base for all holidays in the Gower Peninsula. Situated on Lower Hardingsdown Farm which is a working farm, we are ideally placed for you to take advantage of the surrounding coastal and inland landscapes that make up this beautiful area. Our nearest beach is Llangennith beach only 5 minutes away by car. Safe for swimming and days on the beach and very popular for surfing. The Bunkhouse and Chaffhouse are converted stone barns, providing warm, comfortable and affordable self catering accommodation. The Bunkhouse sleeps up to fourteen people and The Chaffhouse sleeps up to twelve people. They can be booked either separately or together to accommodate larger groups. The Bunkhouse has four bedrooms, sleeps 14 and the beds are all singles or bunk beds. Bedroom 4 sleeps five – upstairs in single beds. 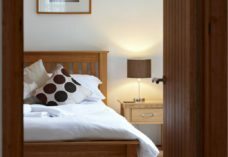 Living room sleeps two – downstairs in two single chair beds, which are very comfortable with slatted bases that don’t feel as if they will spring up and wrap around you like the old Z beds used to! There are three bathrooms (two downstairs and one upstairs) each with wash hand basin, toilet and shower. Outside there is ample parking, and a patio area which is perfect for barbecues. We also provide a separate drying room, a lock up for the storage of any outdoor equipment, and a nearby outside tap for washing your gear. Bedroom 1 sleeps two – downstairs. This has two single beds that can be zipped together to make a large (Super King) double bed. Bedroom 2 sleeps two – upstairs. This has two single beds. Bedroom 4 sleeps four – upstairs. A bunk bed and two single beds that can be zipped together. There are two bathrooms (one upstairs and one downstairs) with wash hand basin, toilet and shower and one wet room (downstairs) suitable for disabled access with overhead shower and wall mounted shower, comfort height toilet and easy access wash hand basin. Outside, there is ample parking for several cars and a patio and lawn area that catches the all day and evening sun, perfect for barbecues. Click any image to view the gallery in a slideshow. Have special requirements? Call Allison Tyrrell on 01792 386222 or 07969 907613. Please note that we only show as booked when both properties are booked.